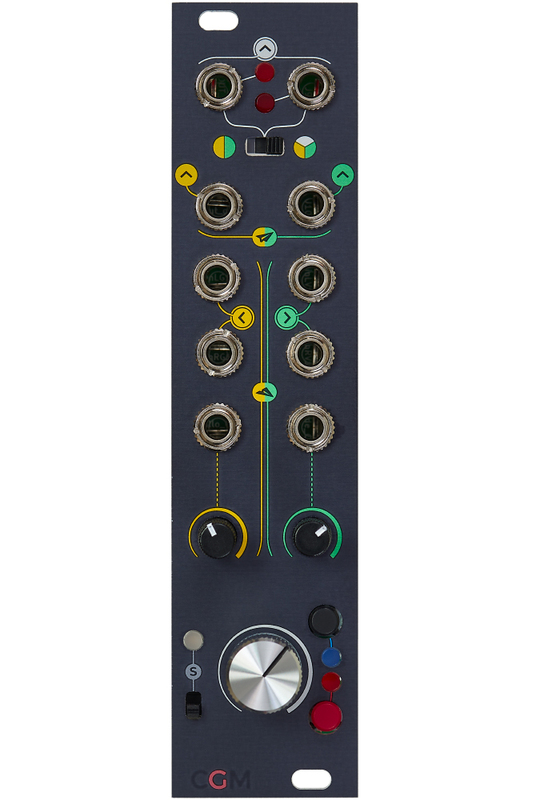 The CGM Creative Mixer is a modular mixing solution for eurorack modular systems, designed to obtain a flexible setup, providing all the tools you may need in studio and during a live performance, as well as everything you may want to control via CV. It is currently composed of three modules: the Channel, the Group and the Master. 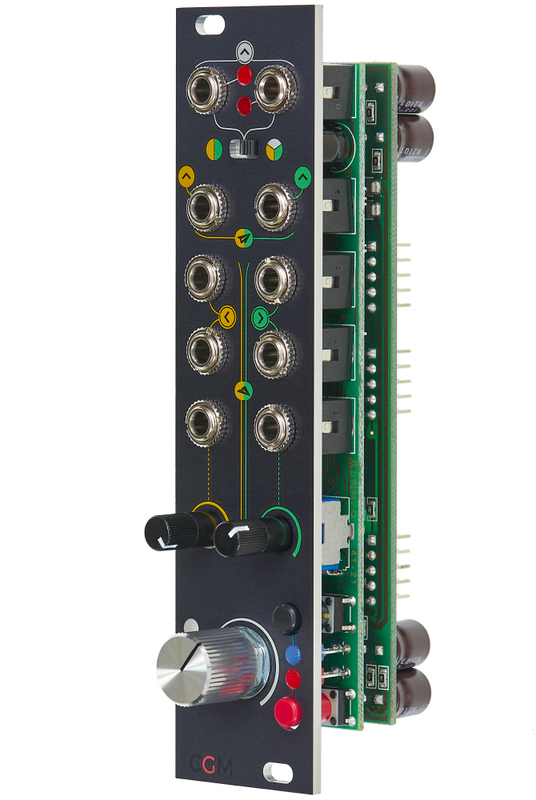 The GROUP sub-module of the high-quality, expandable CGM Creative Mixer system is used for handling a group of up to eight connected channels. It sums their L/R post fade plus their aux send signals and also manages the voltage controllable mono aux sends as well as the mono/stereo return (which in turn are summed to the channels). Also it controls the global solo of thel grouped channels and has L+R outputs. 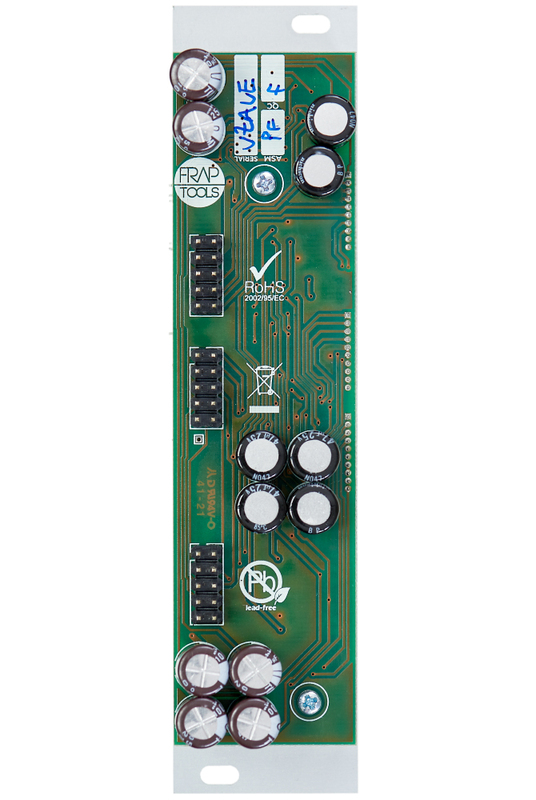 A Group module sums the signals of up to eight connected Channel modules plus their aux sends and also controls the master volume of the stereo sum by using the large "fader" knob. Mono Send. Emits the sum of all "yellow" or "green" aux sends of all connected channels. Two dual mono returns which turn into a stereo return (L+R) when both sockets are in use. CV input of the stereo return VCA. 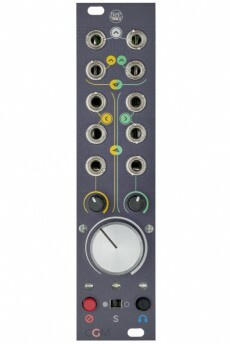 Accepts 0-5V or 0-10V levels. The large potentiometer is the "fader" which controls the Group's output volume (i.e. all stereo sums of Channels and the aux returns). LED visualize the post fader level. The output signals L+R are emitted at the two very top sockets, marked in white. Alternatively the sockets can emit the stereo sum of the aux returns, which is jumper selectable. The red Mute button, muting the entire Group. The safe solo switch S - in left position the safe solo function of all connected channels is active. The blue stereo PFL button which puts the entire Group to the headphone amplifier of the optional Master module. Contained is a pair of Link Cables for connecting up to four Channel modules to one Group.